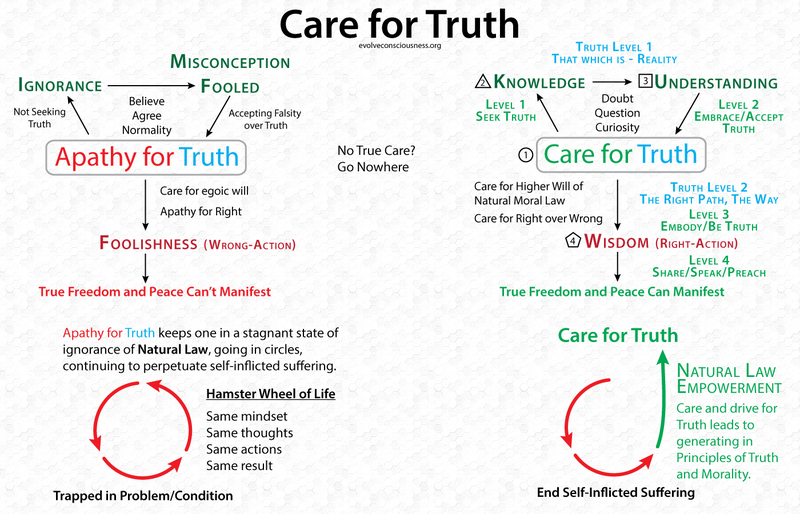 Care for Truth is the motivational generator that will allow us to actualize a future of True Freedom and Peace. Care for Truth is Care for Natural Moral Law. To seek Truth (level 1), embrace and accept it once we find it (level 2), and then aligning ourselves with the Moral Virtues of the Higher Self and Higher Will to embody, live and be that Truth (level 3). Once we understand, embrace and embody the Truth, there is also a “Care for Truth – Level 4”, in tandem with the “Great Work – Level 2”, which is to share/speak/preach the Truth you live with others for them to learn from and live themselves. That is how we get other people to embark on this process to manifest what we want in the aggregate. One person alone in Wisdom will not create True Freedom and Peace. Everyone in the aggregate Wisdom of Right-Action will create the True Freedom and Peace. The Magician influences others through their passion for the Great Work and inspires them to do the same and engage in the Great Work themselves. Morality as mentioned is Love. Love of the blissfull divine child, born again into unconditional loving awareness following union. The child percieves through pure love that which needs loving attention to heal it.